Oven Directions: Heat oven to 250°F. In ungreased large roasting pan, mix cereals, pretzels and almonds. In 1-quart saucepan, heat butter, mustard, honey and seasoned salt over medium heat, stirring frequently, until butter is melted and mixture is hot. Pour over cereal mixture, stirring until evenly coated. Bake uncovered about 45 minutes, stirring every 15 minutes, until mixture begins to brown. Spread on waxed paper or foil to cool, about 15 minutes. Store in airtight container. 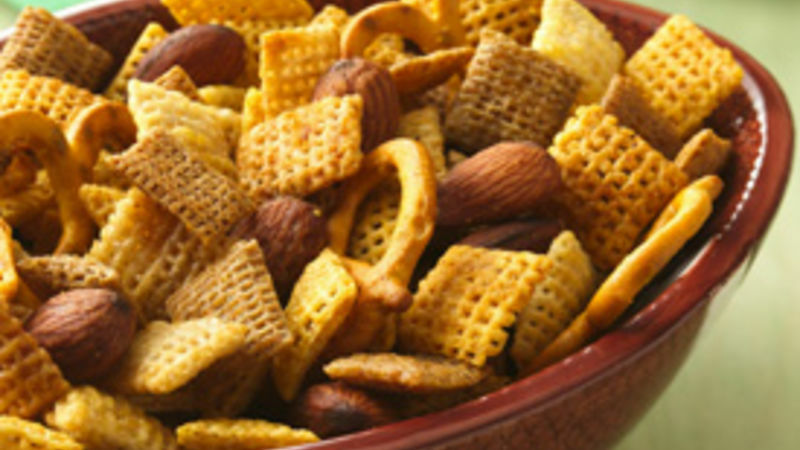 In large microwavable bowl, mix cereals, pretzels and almonds. In microwavable measuring cup, microwave butter, mustard, honey and seasoned salt uncovered on High 1 to 2 minutes or until butter is melted and mixture is hot; stir. Pour over cereal mixture, stirring until evenly coated. Microwave uncovered on High 5 to 6 minutes, stirring every 2 minutes, until mixture begins to brown.